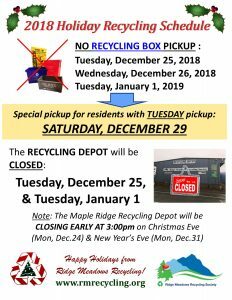 Mark your calendar (especially if you have recycling pickup on Tuesdays!) 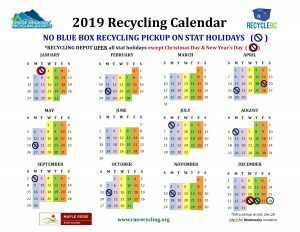 – there will be NO CURBSIDE BLUE BOX RECYCLING PICKUP ON Tuesday, December 25 (Christmas Day), Wednesday, December 26 (Boxing Day), and Tuesday, January 1, 2019 (New Year’s Day). 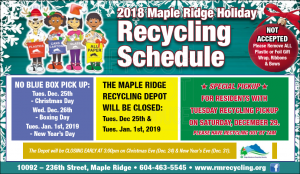 The RECYCLING DEPOT WILL BE CLOSED ON Tuesday, December 25 (Christmas Day) and Tuesday, January 1, 2019 (New Year’s Day) and we will be CLOSING EARLY at 3:00pm on December 24 (Christmas Eve) and December 31 (New Year’s Eve). 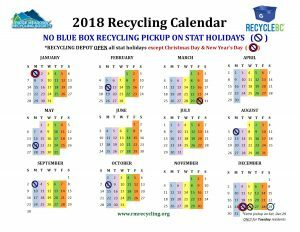 As residents with TUESDAY recycling pickup will be missing two pickups in a row, there will be a SPECIAL RECYCLING PICKUP for TUESDAY RESIDENTS ONLY on SATURDAY, DECEMBER 29. All TUESDAY residents should have their recycling set out on Saturday, December 29 by 7:00am for pickup.